"I am the Soldier in Training, Sailor Chibi Moon, and in the Name of the Future Moon I will punish you!" 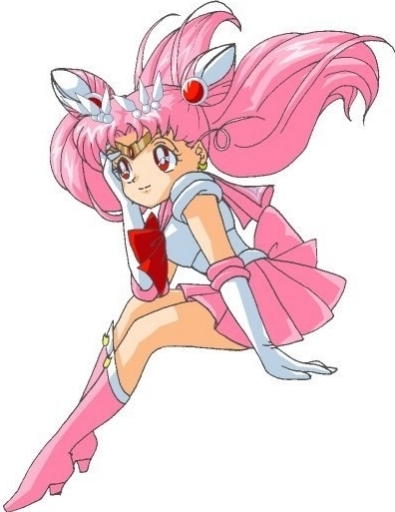 Japanese name: Tsukino Usagi "Chibiusa"
Chibiusa is Mamoru and Usagi's future daughter.She was sent back in time to find the Silver Crystal to save Crystal Tokyo. A lot of people found her annoying at first, and a lot still do, but Chibiusa is really not the annoying spore she seems to be. She's really just a sweet and sometimes lonely little girl. After her home is saved she returns to it, but comes back for training to become a real sailor senshi. At the beginning of Stars she goes home for good. She's a lot like Usagi, Mamoru has said that the two of them are like twins. She has many of the same qualities as Usagi, she is friendly and open like her, and also sometimes a ditz like her. She shows her maturity a lot more than Usagi does and has a real desire to help those in need. She makes friends very easily. In the series finale of Mad About You , Mabel Buckman says "The reason that my mother and I clash so much is that we're so very alike." The same could be said for Usagi and Chibiusa's relationship. They often fight with each other, mostly over Mamoru. Chibiusa has a kind of crush on him, but she does realize that he is her father, and that he and Usagi are meant to be together. Usagi is not yet as mature as she will be in the future when she is Neo Queen Serenity, so she still gets jealous easily and bickers with Chibiusa a lot. But they really do love each other. Chibiusa idolizes her Mummy, and wants to be just like her. Chibiusa meets the Pegasus one night in a dream. He asks her to keep their meetings a secret. It's hard for him to trust her at first, but the two of them soon become friends and have many chats in secret together. Eventually they fall in love with each other. When they share their first kiss, she finds out that he's not just a pegasus, but a young boy named Helios that can transform into a pegasus. She learns that his home world is in great danger, and she and Sailor Moon are the only ones that can save it. However their relationship is left unresolved after Pegasus returns to his home at the end of SMSS. It could possibly be the subject of a future Sailormoon series or OAV. Chibiusa went back in time to find the Ginzuishou (Imperium Silver Crystal). At first she wanted to use its power to become "a real lady, like Mummy." When she touched it, she absorbed it into her body, and she thought it was gone for good. Her dream is to become a lady. She was the only one who didn't think Hotaru's healing power was weird. She is Hotaru's best friend. She is called "Neo Princess Serenity" in the French manga. Her Mummy gave her the nickname "Small Lady"